The worker cooperative movement is growing. Thatâ€™s because people across the country are realizing the economy and the businesses they work for would fair better if they were owned and governed democratically by the people. But starting a worker co-op is difficult, and the process can often be daunting. So that’s why we, The Toolbox for Education and Social Action (TESA), created Own the Change: Building Economic Democracy One Worker Co-op at a Time in collaboration with The Laura Flanders Show. Own the Change is a short, free documentary that gives communities around the country a guide to starting worker co-ops. 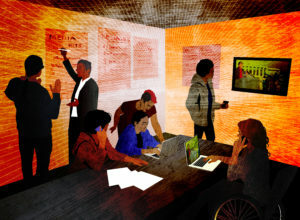 It lays out the the real-world challenges of launching a co-op as well as the transformative benefits the model offers. You can watch the documentary below. But we didnâ€™t just want to put the documentary out on the internet and eventually let it start collecting digital dust. Instead, weâ€™ve been coordinating a nationwide series of screenings of the film with local activists and community organizers. Now, there have been nearly forty screenings of Own the Change since it debuted – in classrooms, church basements, conferences, community centers, and more. Itâ€™s got people talking: what if we owned and ran our workplaces together? Still, we knew that simply screening the documentary might not be enough in many places – and that people would need help facilitating conversations and activities to follow the screenings. So we designed educational tools to be used alongside the film, which local organizers have been using to make the biggest impact possible. Thatâ€™s because we canâ€™t just say, â€œworker co-ops are great!â€ We also have to ask viewers: â€œhow can you and your community use this movement?â€ Thatâ€™s why each screening host gets a discussion guide for use at their events, and we also offer how-to guides to getting a worker cooperative started, like readiness evaluations, resource mapping exercises, and more. Many event organizers have also paired an Own the Change screening with rounds of our board game, Co-opoly: The Game of Cooperatives. This film and its educational materials are helping turn conversations into action in many communities. Syracuse, New York, is one great example. The city has the highest level of segregated black and Latino poor in the country. There, organizers are trying to create the infrastructure for co-op development and education to help solve that issue. And they found Own the Change was a huge help for their efforts. Frank Cetera of the Onondaga Small Business Development Center in Syracuse brought together a coalition of 10 organizations to participate in his Own the Change screening in May of this year. Cooperative Federal Credit Union hosted the event. After all, they were a natural ally – being the cityâ€™s only community development financial institution with a mission to serve a membership that is majority low-income people of color. â€œWe are very explicit in the potential for cooperatives to help solve multiple economic and social issues such as income and wealth inequality, job development and longevity, and community stability,â€ Cetera explained. The fact that a sizeable network backed the event opened the door for a post-film discussion about mapping local assets to support worker co-op development. The organizers hosted a teach-in using the â€œWorker Co-op Walkaround Activityâ€ that we at TESA developed for the filmâ€™s education kits. During this teach-in, attendees identified needs, recognized who in the community could address those needs, and began planning how to get those players involved. Why should we own change? How can we own change? What does “owning the change” really mean on a day to day basis? The organizers also asked viewers to self-organize based on their experience with cooperatives and their goals for attending. Some formed potential co-ops out of that meeting, others connected with resources they needed. These were both AWESOME meetups and the conversations and connections that were made after the movie were exciting,â€ one of the conveners for Agaric, Micky Metts, later told us. â€œBy hosting a Movie Night we connected with several other local co-op minded people and our group is growing. Thanks to the materials from TESA we were able to put on a well-formatted and cohesive presentation and engaging workshops and dialogs! We look forward to hosting more movie nights, but we might need a bigger space! We had hoped that Own the Change would spark a conversation about cooperatives amongst the diverse audiences that make up the movement for economic justice. And based on the experiences of many like Frank and Micky, the film is going beyond just catalyzing conversations. Instead, itâ€™s galvanizing people across the country to create partnerships and alliances that will help them launch cooperatives and build an economy that works for them. This entry was posted in Cooperatives, Creative Projects, Our work, TESA News and tagged co-ops, documentary, free, worker cooperatives. Bookmark the permalink.